Video Shows Fairfax County Police Officer Using Stun Gun on a Black Man Who Complies His Order, People Question Use of Force. The video that was posted on social media shows a Fairfax County Police Officer holding a Taser and giving commands to a man. In the video it appears the man is complying, he turns around and puts his hands on top of the police cruiser, when the officer stuns him with the Taser. He did not try to run or nothing. That was wrong. How the police, unless he was wanted. But if he was wanted, the guy didn't have to Taser him like he did,one witness told Fox 5. People who witnessed the incident question whether the officer needed to use that type of force. They say it is incidents like these that make people distrust the police. As soon as the Chief was alerted that this video was out there in existence he ordered internal affairs to conduct an inquiry,said Lt. Brooke Wright, with the Fairfax County Police Department. She adds that the officer was investigating reports of a theft and the man in the video was later arrested. As far as the use of the stun gun, Lt. Wrights says Internal Affairs is investigating. They're trying to find all the witnesses they can to determine what happened prior to this event and what happened after the event. And it's very hard to tell from a video when you have a very short snap shot in time, what events all occurred,said Lt. Wright. Witnesses who saw the exchange are concerned about the officers actions. On that short snippet, it does appear concerning. And that's why we're looking into it. The community has a right to be concerned. We're concerned anytime something on its face in that way looks like it's an unjustified use of force and that's to be determined. If the officer is wrong he'll be held accountable, said Lt. Wright. FAIRFAX, Va. — A video posted online of a Fairfax County police officer using a stun gun during an arrest has triggered an internal inquiry into the officer’s use of force. The officer is expected to meet with the department’s Internal Affairs Bureau on Monday morning. Fairfax County Police Chief Edwin Roessler ordered the review this weekend, just hours after a video surfaced online of the Thursday, Sept. 24 arrest. In the shaky, 15-second video, before the suspect and the officer drift off the screen, the officer appears to be pointing a stun gun at the suspect, who was later arrested on larceny charges. 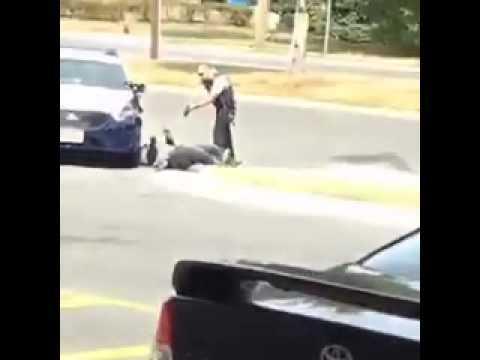 “I’m very concerned because the part that I saw was a black man with his back turned that got Tased,” says Shirley Ginwright, president of the Fairfax County branch of the NAACP. Ginwright says a complaint has been filed with her office over the Thursday incident, which occurred in the Rose Hill area of the Franconia District. “I just thank God for the video cameras that are there that people can now put them on YouTube,” Ginwright says. Fairfax County Police say they want a complete picture of what happened. ‘This is a very, very short snippet of information. We don’t know everything that led up to the event. We don’t know everything that happened after,” says Fairfax County Police 2nd Lt. Brooke Wright. The Internal Affairs Bureau has already launched its investigation and is asking for any witnesses to the incident to step forward. The man struck by the electronic control weapon declined any hospital treatment. I'm sure us negros are bad and it's the police who are the victims like what white people tell me. but what about black on black crime?